The Singer 4432 features 32 built-in stitches, an automatic needle threader, stainless steel bed plate, top-drop-in bobbin with clear view cover, fully automatic 1-step buttonhole, snap-on presser feet, on board storage. With up to 1,100 stitches per minute, up to a 6mm stitch width and a 60% more powerful motor, this machine is ready to sew! Many other sewing machine accessories included. 6 Basic Stitches, 7 Stretch Stitches, 18 Decorative Stitches, 1 Auto Buttonhole—perfect for crafts, home decor, clothing construction and much more! 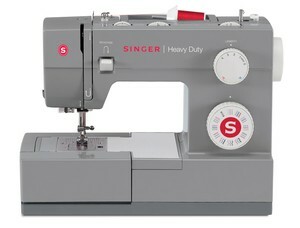 SINGER® Heavy Duty 4423 Sewing Machine. Learn about the many features offered on the SINGER® Heavy Duty 4423 sewing machine.